This is our new Ford 2600 Tractor which I braught in November 2000 from a farmer who owned it sinced new. There are 1800 ours on it and apparently the tyres are original. 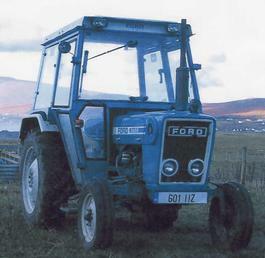 It is a 1978 model and certain features differ on this one from the other Tractor such as no white stripe on side between the door and window along with other differences such as safty handles inside the doors and plastic covers over the mudguards inside. I drive it in low booster around the fields and dogs here in Achill.